The PQ interval starts at the beginning of the atrial contraction and ends at the beginning of the ventricular contraction. 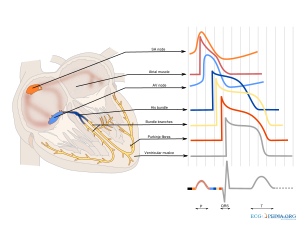 The PQ interval (sometimes referred to as the PR interval as a Q wave is not always present) indicates how fast the action potential is transmitted through the AV node (atrioventricular) from the atria to the ventricles. Measurement should start at the beginning of the P wave and end at the beginning of the QRS segment. The normal PQ interval is between 0.12 and 0.20 seconds. A prolonged PQ interval is a sign of a degradation of the conduction system or increased vagal tone (Bezold-Jarisch reflex), or it can be pharmacologically induced. This is called 1st, 2nd or 3rd degree AV block. A short PQ interval can be seen in the WPW syndrome in which faster-than-normal conduction exists between the atria and the ventricles. For the diagnosis of LBBB or RBBB QRS duration must be >120 ms. 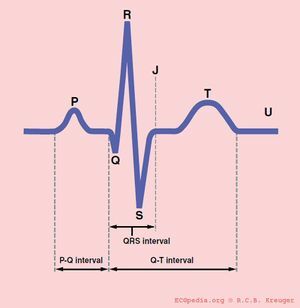 The QT interval starts at the onset of the Q wave and ends where the tangent line for the steepest part of the T wave intersects with the baseline of the ECG. The eyeballing method to estimate QT prolongation. 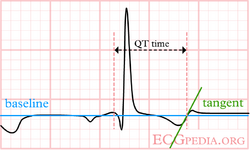 If the QT interval ends before the imaginary boundary halfway two QRS complexes, the QTc is probably normal. If the QTc reaches beyond the halfway line, the QTc is probably prolonged. This method is only 'valid' in registrations with normal (60-100/min) heart rates. The normal QTc (corrected) interval The QT interval indicates how fast the ventricles are repolarized, becoming ready for a new cycle. In a recent ACC consensus document an expert writing group suggest that in a hospital setting the upper limit be raised to the 99th percentile of normal: 470ms in males and 480 ms in females, as approximately 10% to 20% of the general population have a QTc > 440m s. For both men and women QTc > 500ms is considered highly abnormal. If QTc is < 340ms short QT syndrome can be considered. Thus at a heart rate of 60 bpm, the RR interval is 1 second and the QTc equals QT/1. The QTc calculator can be used to easily calculate QTc from the QT and the heart rate or RR interval. On modern ECG machines, the QTc is given. However, the machines are not always capable of making the correct determination of the end of the T wave. Therefore, it is important to check the QT time manually. Hodges: QTc = QT + 1.75 (heart rate - 60). Use lead II. Use lead V5 alternatively if lead II cannot be read. Draw a tangent against the steepest part of the end of the T wave. If the T wave has two positive deflections, the taller deflection should be chosen. If the T wave is biphasic, the end of the taller deflection should be chosen. 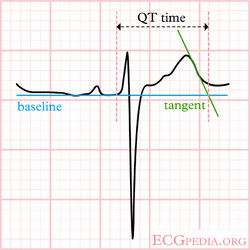 The QT interval starts at the beginning of the QRS interval and ends where the tangent and baseline cross. If the QRS duration exceeds 120ms the amount surpassing 120ms should be deducted from the QT interval (i.e. QT=QT-(QRS width-120ms) ). Calculate QTc according to Bazett: . You can use the QTc calculator for this. During ventricular pacing this method overestimates the QTc. The Framingham formula performs better during pacing, but still overestimates the QTc in sinus rhythm (in the same patient) by about 37-43 msec. In a pathological prolonged QT time, it takes longer than the normal amount of time for the myocardial cells to be ready for a new cycle. There is a possibility that some cells are not yet repolarized, but that a new cycle is already initiated. These cells are at risk for uncontrolled depolarization, induction of Torsade de Pointes and subsequent Ventricular Fibrillation. QT prolongation is often treated with beta blockers. 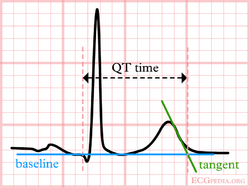 If the QT segment is abnormal, it can be difficult to define the end of the T wave. Below are a number of examples that suggest how QT should be measured in these patients. The T wave is broad, but the tangent crosses the baseline before the T wave joins the baseline. The QT interval would be overestimated when this last definition of the end of the T wave would be used. The ECG does not meet the baseline after the end of the T wave. Still, the crossing of the tangent and baseline should be used for measurements. A bifasic T wave. The tangent to the 'hump' with the largest amplitude is chosen. This can change from beat to beat, making it more important to average several measurements. This page was last edited on 8 September 2013, at 22:00.